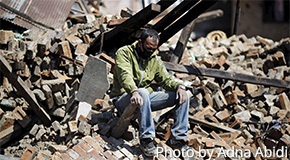 Give: Financial support for relief efforts can be designated to DR999999 with reference to Nepal. Gifts can be made online, by phone (800) 872-3283weekdays between 8 a.m. and 6 p.m. (EST), or checks can be mailed to Presbyterian Church (U.S.A.), P.O. Box 643700, Pittsburg, PA 15264-3700.